"com.typesafe.akka" %% "akka-cluster" % "2.3.4"
To enable cluster capabilities in your Akka project you should, at a minimum, add the Remoting settings, but with akka.cluster.ClusterActorRefProvider. The akka.cluster.seed-nodes should normally also be added to your application.conf file. The easiest way to run this example yourself is to download Typesafe Activator and open the tutorial named Akka Cluster Samples with Scala. It contains instructions of how to run the SimpleClusterApp. The seed nodes can be started in any order and it is not necessary to have all seed nodes running, but the node configured as the first element in the seed-nodes configuration list must be started when initially starting a cluster, otherwise the other seed-nodes will not become initialized and no other node can join the cluster. The reason for the special first seed node is to avoid forming separated islands when starting from an empty cluster. It is quickest to start all configured seed nodes at the same time (order doesn't matter), otherwise it can take up to the configured seed-node-timeout until the nodes can join. Once more than two seed nodes have been started it is no problem to shut down the first seed node. If the first seed node is restarted it will first try join the other seed nodes in the existing cluster. If you don't configure the seed nodes you need to join manually, using JMX or Command Line Management. You can join to any node in the cluster. It doesn't have to be configured as a seed node. Joining can also be performed programatically with Cluster(system).join. Note that you can only join to an existing cluster member, which means that for bootstrapping some node must join itself. You may also use Cluster(system).joinSeedNodes, which is attractive when dynamically discovering other nodes at startup by using some external tool or API. When using joinSeedNodes you should not include the node itself except for the node that is supposed to be the first seed node, and that should be placed first in parameter to joinSeedNodes. Unsuccessful join attempts are automatically retried after the time period defined in configuration property retry-unsuccessful-join-after. When using seed-nodes this means that a new seed node is picked. When joining manually or programatically this means that the last join request is retried. Retries can be disabled by setting the property to off. An actor system can only join a cluster once. Additional attempts will be ignored. When it has successfully joined it must be restarted to be able to join another cluster or to join the same cluster again. It can use the same host name and port after the restart, but it must have been removed from the cluster before the join request is accepted. When a member is considered by the failure detector to be unreachable the leader is not allowed to perform its duties, such as changing status of new joining members to 'Up'. The node must first become reachable again, or the status of the unreachable member must be changed to 'Down'. Changing status to 'Down' can be performed automatically or manually. By default it must be done manually, using JMX or Command Line Management. It can also be performed programatically with Cluster(system).down(address). Be aware of that using auto-down implies that two separate clusters will automatically be formed in case of network partition. That might be desired by some applications but not by others. You can just stop the actor system (or the JVM process). It will be detected as unreachable and removed after the automatic or manual downing as described above. A more graceful exit can be performed if you tell the cluster that a node shall leave. This can be performed using JMX or Command Line Management. It can also be performed programatically with Cluster(system).leave(address). Note that this command can be issued to any member in the cluster, not necessarily the one that is leaving. The cluster extension, but not the actor system or JVM, of the leaving member will be shutdown after the leader has changed status of the member to Exiting . Thereafter the member will be removed from the cluster. Normally this is handled automatically, but in case of network failures during this process it might still be necessary to set the node’s status to Down in order to complete the removal. You can subscribe to change notifications of the cluster membership by using Cluster(system).subscribe. Note that you may receive an empty CurrentClusterState, containing no members, if you start the subscription before the initial join procedure has completed. This is expected behavior. When the node has been accepted in the cluster you will receive MemberUp for that node, and other nodes. If you find it inconvenient to handle the CurrentClusterState you can use ClusterEvent.InitialStateAsEvents as parameter to subscribe. That means that instead of receiving CurrentClusterState as the first message you will receive the events corresponding to the current state to mimic what you would have seen if you were listening to the events when they occurred in the past. Note that those initial events only correspond to the current state and it is not the full history of all changes that actually has occurred in the cluster. ClusterEvent.MemberUp - A new member has joined the cluster and its status has been changed to Up. Instead of subscribing to cluster events it can sometimes be convenient to only get the full membership state with Cluster(system).state. Note that this state is not necessarily in sync with the events published to a cluster subscription. Let's take a look at an example that illustrates how workers, here named backend, can detect and register to new master nodes, here named frontend. The Typesafe Activator tutorial named Akka Cluster Samples with Scala. contains the full source code and instructions of how to run the Worker Dial-in Example. With a configuration option you can define required number of members before the leader changes member status of 'Joining' members to 'Up'. In a similar way you can define required number of members of a certain role before the leader changes member status of 'Joining' members to 'Up'. You can start the actors in a registerOnMemberUp callback, which will be invoked when the current member status is changed tp 'Up', i.e. the cluster has at least the defined number of members. This can be implemented by subscribing to member events, but there are several corner cases to consider. Therefore, this specific use case is made easily accessible by the Cluster Singleton in the contrib module. See Cluster Sharding in the contrib module. See Distributed Publish Subscribe in Cluster in the contrib module. See Cluster Client in the contrib module. If system messages cannot be delivered to a node it will be quarantined and then it cannot come back from unreachable. This can happen if the there are too many unacknowledged system messages (e.g. watch, Terminated, remote actor deployment, failures of actors supervised by remote parent). Then the node needs to be moved to the down or removed states and the actor system must be restarted before it can join the cluster again. 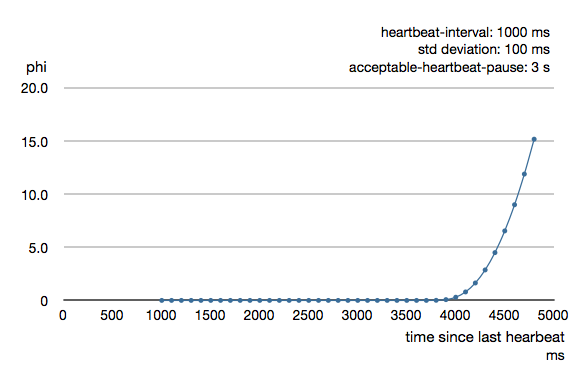 To be able to survive sudden abnormalities, such as garbage collection pauses and transient network failures the failure detector is configured with a margin, akka.cluster.failure-detector.acceptable-heartbeat-pause. You may want to adjust the Configuration of this depending on you environment. 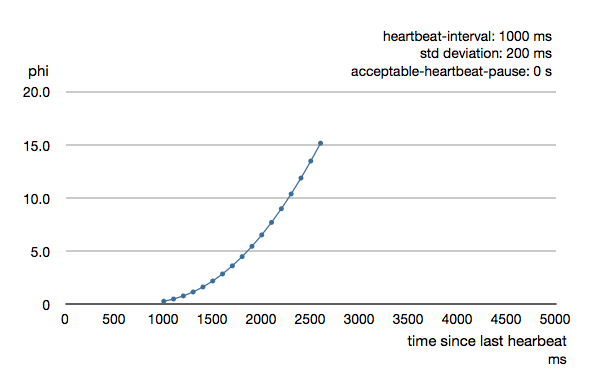 This is how the curve looks like for acceptable-heartbeat-pause configured to 3 seconds. All routers can be made aware of member nodes in the cluster, i.e. deploying new routees or looking up routees on nodes in the cluster. When a node becomes unreachable or leaves the cluster the routees of that node are automatically unregistered from the router. When new nodes join the cluster additional routees are added to the router, according to the configuration. Routees are also added when a node becomes reachable again, after having been unreachable. There are two distinct types of routers. Group - router that sends messages to the specified path using actor selection The routees can be shared between routers running on different nodes in the cluster. One example of a use case for this type of router is a service running on some backend nodes in the cluster and used by routers running on front-end nodes in the cluster. Pool - router that creates routees as child actors and deploys them on remote nodes. Each router will have its own routee instances. For example, if you start a router on 3 nodes in a 10 nodes cluster you will have 30 routee actors in total if the router is configured to use one inctance per node. The routees created by the different routers will not be shared between the routers. One example of a use case for this type of router is a single master that coordinate jobs and delegates the actual work to routees running on other nodes in the cluster. The routee actors should be started as early as possible when starting the actor system, because the router will try to use them as soon as the member status is changed to 'Up'. If it is not available at that point it will be removed from the router and it will only re-try when the cluster members are changed. It is the relative actor paths defined in routees.paths that identify what actor to lookup. It is possible to limit the lookup of routees to member nodes tagged with a certain role by specifying use-role. nr-of-instances defines total number of routees in the cluster. Setting nr-of-instances to a high value will result in new routees added to the router when nodes join the cluster. See Configuration section for further descriptions of the settings. Let's take a look at how to use a cluster aware router with a group of routees, i.e. router sending to the paths of the routees. The example application provides a service to calculate statistics for a text. When some text is sent to the service it splits it into words, and delegates the task to count number of characters in each word to a separate worker, a routee of a router. The character count for each word is sent back to an aggregator that calculates the average number of characters per word when all results have been collected. Note, nothing cluster specific so far, just plain actors. This means that user requests can be sent to StatsService on any node and it will use StatsWorker on all nodes. The Typesafe Activator tutorial named Akka Cluster Samples with Scala. contains the full source code and instructions of how to run the Router Example with Group of Routees. It is possible to limit the deployment of routees to member nodes tagged with a certain role by specifying use-role. nr-of-instances defines total number of routees in the cluster, but the number of routees per node, max-nr-of-instances-per-node, will not be exceeded. Setting nr-of-instances to a high value will result in creating and deploying additional routees when new nodes join the cluster. Let's take a look at how to use a cluster aware router on single master node that creates and deploys workers. To keep track of a single master we use the Cluster Singleton in the contrib module. The ClusterSingletonManager is started on each node. We also need an actor on each node that keeps track of where current single master exists and delegates jobs to the StatsService. That is provided by the ClusterSingletonProxy. The ClusterSingletonProxy receives text from users and delegates to the current StatsService, the single master. It listens to cluster events to lookup the StatsService on the oldest node. The Typesafe Activator tutorial named Akka Cluster Samples with Scala. contains the full source code and instructions of how to run the Router Example with Pool of Remote Deployed Routees. The member nodes of the cluster collects system health metrics and publishes that to other nodes and to registered subscribers. This information is primarily used for load-balancing routers. "org.fusesource" % "sigar" % "1.6.4"
mix / MixMetricsSelector - Combines heap, cpu and load. Weights based on mean of remaining capacity of the combined selectors. The collected metrics values are smoothed with exponential weighted moving average. In the Configuration you can adjust how quickly past data is decayed compared to new data. Let's take a look at this router in action. What can be more demanding than calculating factorials? It is only router type adaptive and the metrics-selector that is specific to this router, other things work in the same way as other routers. The Typesafe Activator tutorial named Akka Cluster Samples with Scala. contains the full source code and instructions of how to run the Adaptive Load Balancing sample. It is possible to subscribe to the metrics events directly to implement other functionality. You can plug-in your own metrics collector instead of akka.cluster.SigarMetricsCollector or akka.cluster.JmxMetricsCollector. Look at those two implementations for inspiration. The implementation class can be defined in the Configuration. Most of this can of course be extracted to a separate trait to avoid repeating this in all your tests. Notice how the testActor from testkit is added as subscriber to cluster changes and then waiting for certain events, such as in this case all members becoming 'Up'. 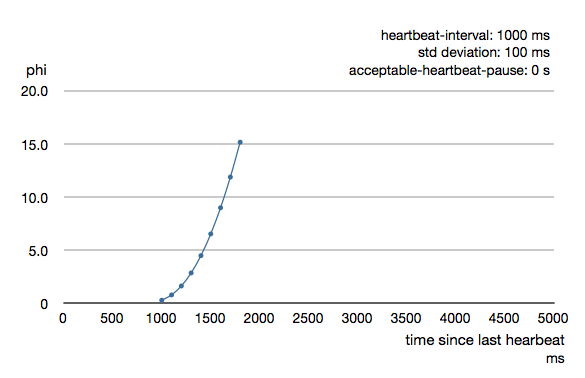 Once again we take advantage of the facilities in testkit to verify expected behavior. Here using testActor as sender (via ImplicitSender) and verifing the reply with expectMsgPF. Member nodes are identified by their address, in format akka.<protocol>://<actor-system-name>@<hostname>:<port> . The cluster can be managed with the script bin/akka-cluster provided in the Akka distribution.